The last time these 2 teams played each other at Galabank was at the end of last season when East Stirlingshire scuppered Annan’s chances of making the play offs after they recorded a comprehensive 3-1 victory, well the Shire never won this match but they came very close to producing another Scottish Cup upset in this goal less but exciting game where neither team took the opportunities that they created. East Stirlingshire started very impressively and they had Annan on the back foot for the opening 15 minutes and it was a period in the match which they will look back on with some regret. Right from the whistle Annan were being forced to defend as East Stirling imposed their authority on the match. In the third minute from a corner kick captain Derek Ure was denied a goal when his shot crashed against the post. Annan lost the services of captain Steven Black in the 5th minute when he sustained what looked like a bad ankle injury to be replaced by Raffi Krissian. Annan were riding their luck and defended a couple of corners and efforts by David Grant and Andy Rodgers went close. It was a promising opening period by the visitors, Annan’s first real attempt came in the 14th minute when Rabin Omar tested keeper Jamie Barclay. It was however Omar’s last contribution as he was forced to leave the field of play with a hamstring injury. The game switched to the opposite end if the park and minutes later Annan keeper Blair Currie did well to push Paul Sludden’s low shot round the post for a corner kick. Annan were looking more menacing as the match progressed and in the 23rd minute David McKenna’s overhead kick following a corner was confidently saved by Jamie Barclay. Annan followed this up with a Darren Ramsay effort which sailed over the bar from the edge of the box. Andy Rodgers forced Blair Currie to tip the ball over the bar in the 33rd minute as the Shire looked to open their account. Sludden then had Blair Currie at full stretch with a low shot into the corner of the net. Annan finished the half with more promise, Darren Ramsay came close with a shot from the edge of the box with the effort going narrowly past the post. The visitors finished the half on the attack when Simon White’s well struck shot missed the target. Annan started the second half in a more promising vein and Darren Ramsay’s snap shot from wide in the left slipped past Jamie Barclay’s left hand post. A penetrating run by Andy Rodgers to the heart of the Annan defence forced a corner in the 59th minute. 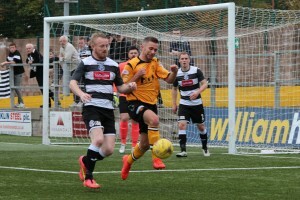 The shire goal survived unscathed in the 61st minute when Darren Ramsays shot struck the upright and Max Wright following up missed a golden opportunity to put Annan ahead. A well worked free kick minutes later tested the Annan defence. Ryan Sinnamon made a great run only to be stopped in his tracks 30 yards out but Ramsay’s free kick was poor and over the bar. The shire forced a couple of corners and Annan replied with a good move down the right ending with a superb Jean Guy Lucas shot which beat the keeper but just missed the target and minutes later the French lad sent in an inviting cross for Ramsay but once again the opportunity was squandered. In the end both teams will have to play it over again at Ochilview next Saturday. There were a few shocks in the first round matches with Hawick Royal Albert defeating Berwick Rangers 3-2 to produce the shock of the day, Lowland League leaders East Kilbride beat SPFL side Cowdenbeath 2-0 and Gretna returned from Buckie Thistle with a creditable 1-1 draw to earn a replay. The romance of the Scottish Cup lives on to produce the upsets which make the cup such an unpredictable competition. ANNAN ATHLETIC : Blair Currie, Steven Black (Raffi Krissian 5 min), Steven Swinglehurst, Ryan Sinnamon, Peter Watson, Barry Cuddihy, Rabin Omar (Max Wright 14 min), Ryan Finnie, David McKenna, Jean Guy Lucas, Darren Ramsay. Substitutes not used Alex Mitchell, Adam Ashgar, Aaron Bradbury, Stephen Bronsky, Callum Home. EAST STIRLINGSHIRE :Jamie Barclay, Graeme McGregor, Liam Allison, Andy Grant, Connor Greene, Simon White (Jamie Glasgow 80 min ), Andy Rodgers, Derek Ure, David Grant ( ), Paul Sludden, Kris Faulds, Substitutes not used Dean Shaw GK, Dylan McGuigan, Connor Hogg, Adam Murray, Drew Ramsay, Lewis Peddie.